To make the kimchi, divide the cabbage into quarters and rub salt between each leaf. Place in the fridge for a few hours until the leaves slightly wilt – the leaves should bend without snapping. Combine the minced ginger and garlic with the sliced chilies and spring onions and add the fish sauce, honey and chilli powder. Lightly rinse the wilted kimchi with cold water, then rub the chilli mix into every part of all the cabbage leaves. Neatly place each piece of cabbage into a container and cover with cling film, leave to ferment for 1 week at room temperature. It can store for up to 1 month. When fermented, finely cut width wise and bind with the Japanese (Kewpie) mayonnaise. For the shoestring potatoes, start by rinsing the potatoes, then slicing on mandolin using the julienne attachment in 2mm wide pieces. Heat the frying oil to 140°C and fry the shoestring potatoes until golden and crispy. Remove, drain on a rack and season with salt. To make the crispy shallots, finely slice the shallots into thin rings. Toss in the corn flour to lightly coat. Heat the frying oil to 160°C and fry the shallots until crispy. Remove, drain on kitchen paper and set aside. Heat the BBQ and grill the hot dogs until done, then remove and rest. Lightly toast the hotdog brioche bun on the grill. 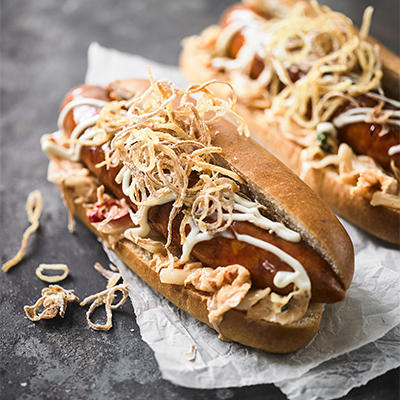 Place some kimchi mayo on the bottom of the bun and place the hot dog on top of that. Top with some more kimchi mayo, the crispy onions and the potatoes.